This week I had the good fortune to visit Anna Bing Arnold Children’s Center at Cal State L.A., where creative ideas are thriving. Curriculum Coordinator Alexandra Walsh and Director Patricia Ulloa have decades of combined experience and a particularly innovative staff. Like Dominic, who facilitated this brilliant collaborative puzzle piece painting with three- and four-year-olds, which immediately caught my eye. Isn’t it brilliant? 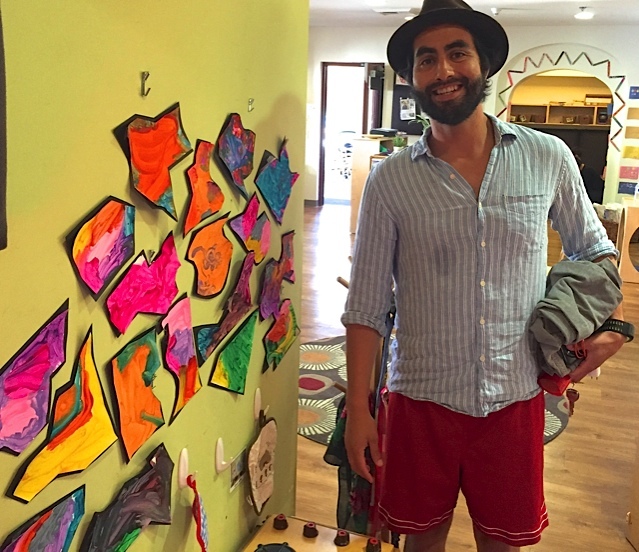 Dominic explained how this experimental project began by cutting 12 x 18” Real Watercolor Paper into puzzle shapes, then prompting children to select a shape and paint it using Colorations® Simply Washable Fluorescent Tempera. 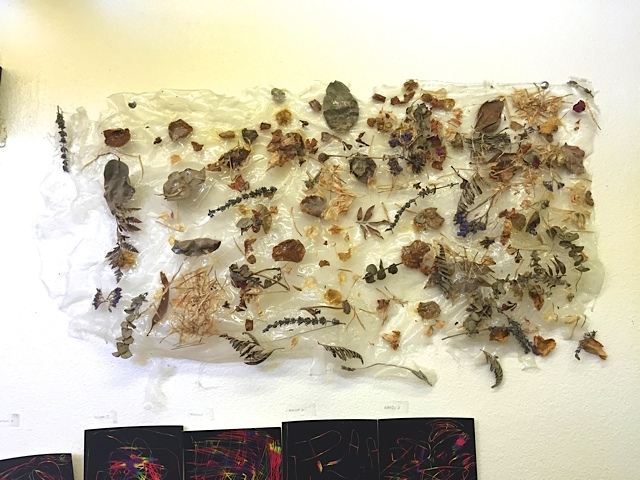 The puzzle pieces were placed in a basket in the art area for use at any time. The intense color you see here resulted from distinct 3 variables: (1) using fluorescent paint, (2) mounting each puzzle piece painting onto black construction paper, then trimming a close border, and (3) by using watercolor paper instead of white construction paper. 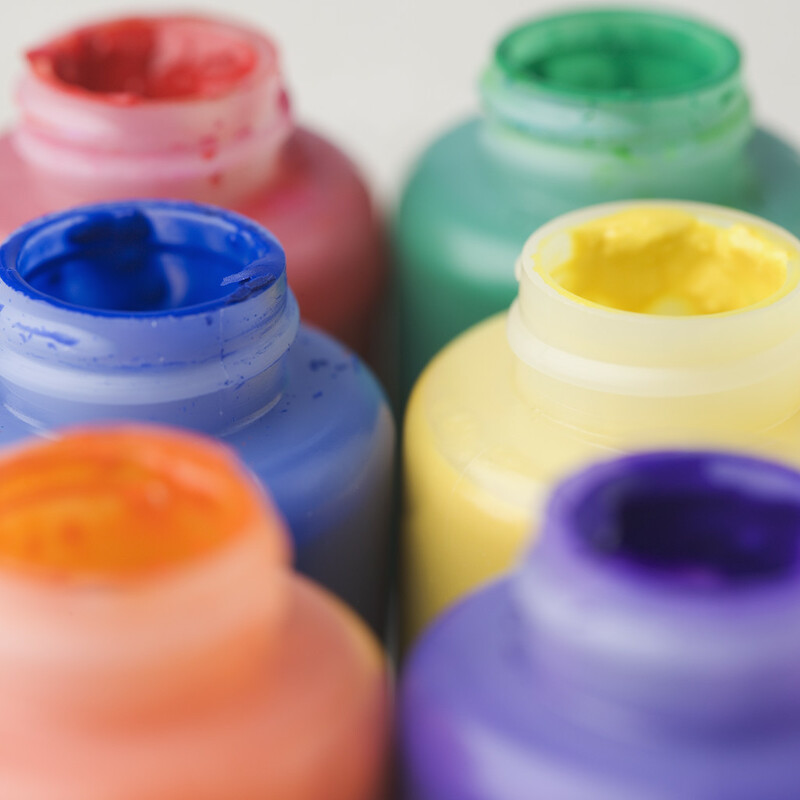 The added thickness (and spongy quality) of watercolor paper absorbs more pigment than regular paper, giving the finished paintings a visual “pop.” Nice! 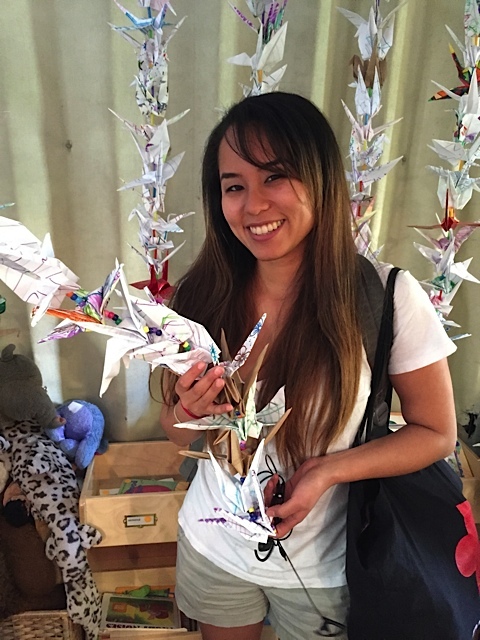 I fell in love with this Thousand Cranes Origami project, facilitated by Jasmine Cruz and Raul Delgado, which creates a unique environment that children, parents and teachers all participated in! 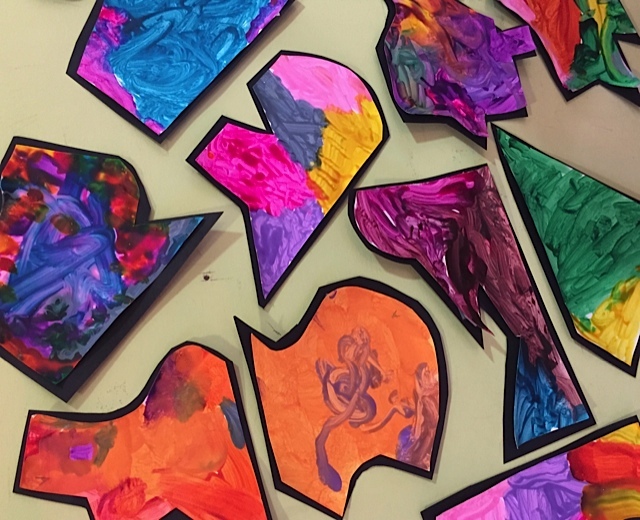 This delightful classroom activity, which combines open-ended art with math foundations and collaborative teamwork, embodies the “Four C’s” which children will later address in Kindergarten and elementary school. 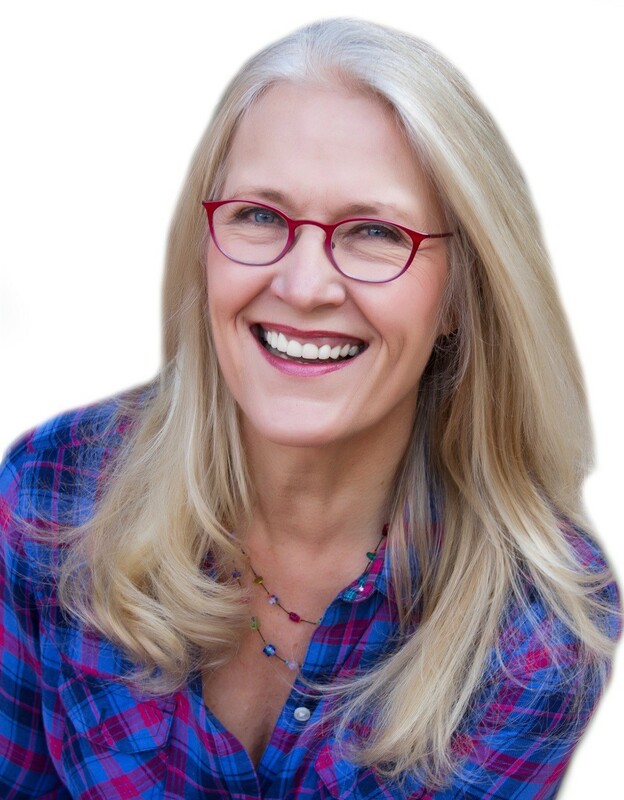 These “Four C’s” are the four specific skills deemed by the US Dept of Education to be the most important for preparing students to succeed in the 21st century: critical thinking, communication, collaboration, and creativity. Kudos to Jasmine and Raul for initiating an important learning experience while adding beauty and innovation to their school. A Thousand Origami Cranes is a group of one thousand origami paper cranes held together by strings. 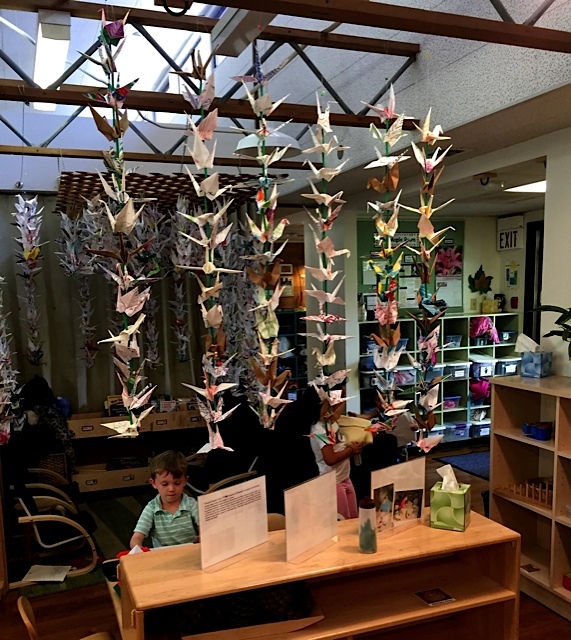 An ancient Japanese legend promises that anyone who folds a thousand origami cranes will be granted a wish by a crane. Some stories believe you are granted eternal good luck. The crane in Japan is one of the mystical or holy creatures that is said to live for a thousand years: That is why 1,000 cranes are made, one for each year. 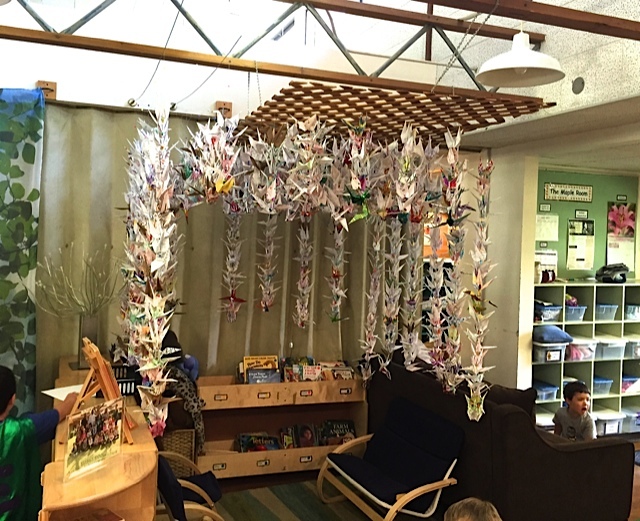 Here children decorated papers over the course of two months, while parents and staff folded them into a thousand origami cranes. 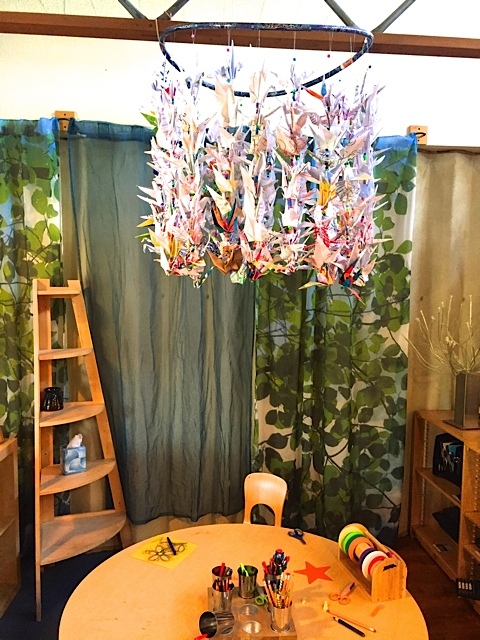 Thanks to patience and motivation, the children’s parents, grandparents and teachers strung all thousand of their hand-colored paper cranes onto cord and even added pony beads for charm. Creative art programs like this one develop over time as the result of intention and practice on the part of administration and teachers. Lots of little tips that facilitate art set-ups are learned from experience. 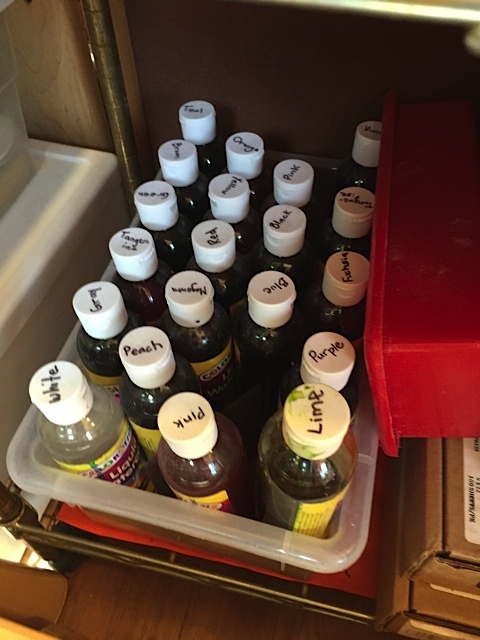 Writing the paint color of each bottle on the top of the white lid makes identifying each bottle a breeze. 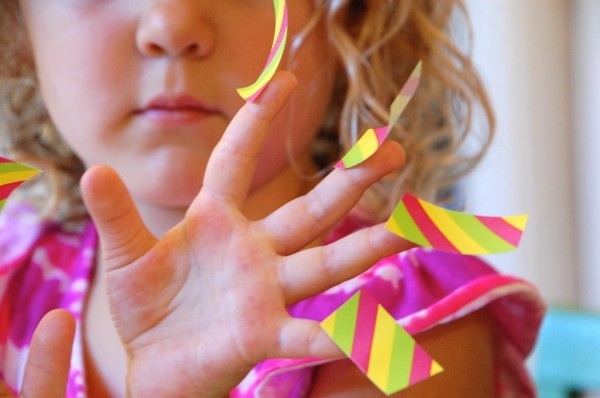 Glue doesn’t just stick things together. It can be used in unique ways and one way is to pour a thick layer of clear glue onto a smooth surface and add seed pods, ferns and natural collage elements. When the thick layer of glue eventually dries, it creates a unique semi-clear glaze which holds the collage elements together. This second collage also uses clear glue, but in this one the glue is first infused with Colorations® Liquid Watercolor, then is painted and drizzled onto butcher paper. Last but not least I re-discovered one of my favorite art techniques at Anna Bing Arnold that day: the wonderful effect of colored chalk on black paper. 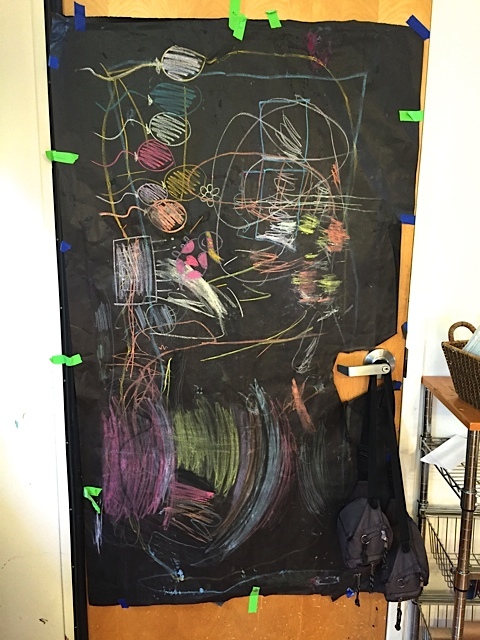 This black butcher paper mural has so much energy, and I love how the door handle was cut out! 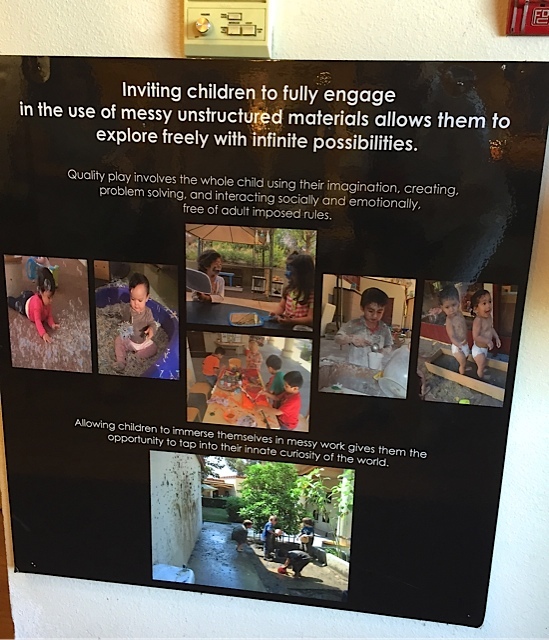 It also beautifully illustrates the constructionist idea on the poster in the center’s lobby: “Inviting children to fully engage in the use of messy, unstructured materials allows them to explore freely with infinite possibilities.” Thank you, Alex and staff for a LOT of inspiration. Which one do YOU want to try?